Before we get started, don’t worry: there’s no sewing involved in this project and there aren’t any tricky patterns to follow. 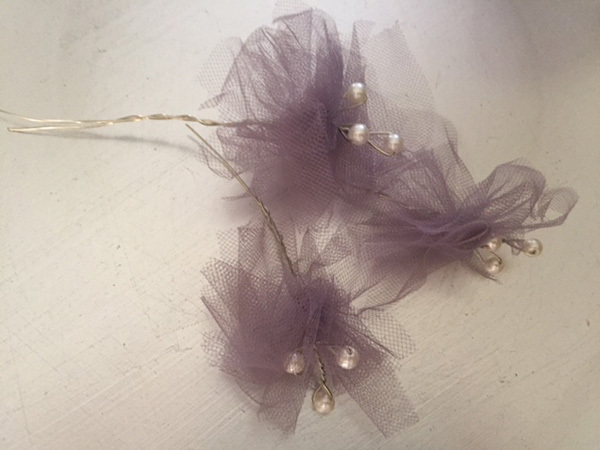 These no-sew beaded tulle picks can easily replace (or supplement) the flowers in your bouquets, your boutonnieres, and even your corsages. And because they’re so lightweight, you can even make a few extra to decorate your cake or incorporate into your veil. All you need is some tulle, some beads, and a little bit of a patience. Note: Make sure your wire is thin enough to fit through your beads. Some large-gauged wire is too thick to fit through small seed beads. 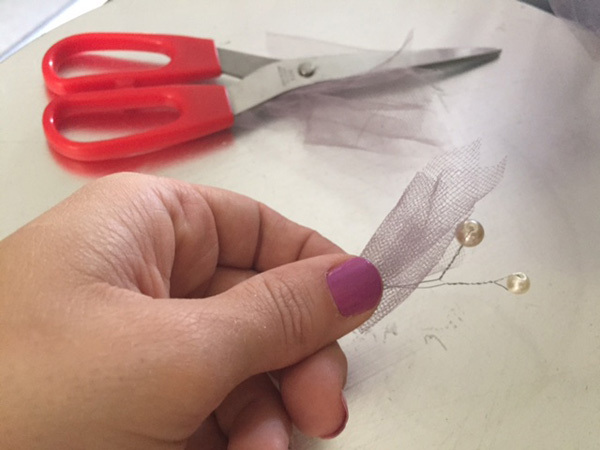 Step 1: Cut your tulle into small square or square-like shapes of varying size. Aim for something between 2 to 4 inches and don’t worry about making your shapes uniform or perfect. 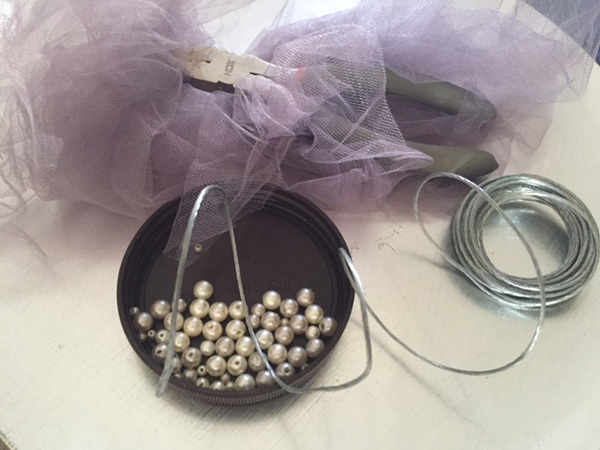 Step 2: To create the “stem” for your tulle flowers, use your wire cutters to cut a piece of wire about 24 inches long. 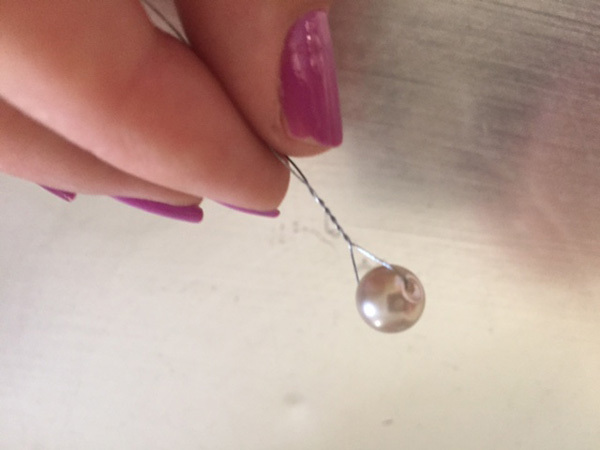 String one of your pearl beads onto the center of the wire and fold the wire in half around the bead. Grasp the two strands of wire with your pliers approximately 1 inch below the bead and twist them together. This will hold the bead in place. Step 4: By this time, you should have two strands of wire of approximately equal length. 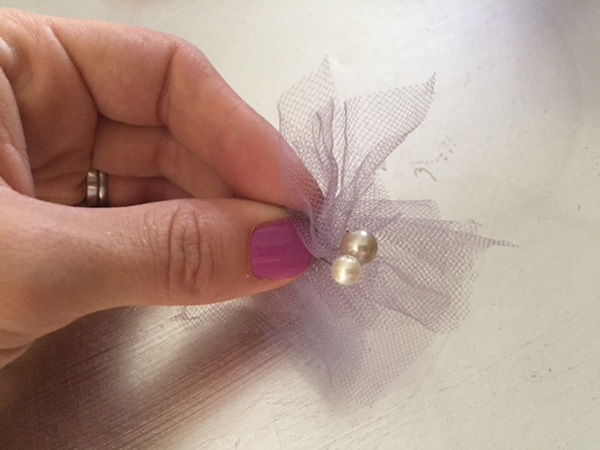 Join them together and poke the ends through your first piece of tulle to form a “petal.” Guide the tulle up the wire toward the beads, allowing it to bend and scrunch up as you go. Add four or five additional tulle pieces in the same manner. For fullness, add them one at a time, make them slightly off-center, or fold the petals in half before adding them to the wire stem. Step 5: Adjust the shape of your petals until you’re satisfied, and then twist the two wires together to hold everything in place. For boutonnieres and corsages, trim the remaining wire to just a few inches. For bouquets, leave the stems nice and long. If you’re using a florist for your wedding, be sure to check with them about the preferred length for your tulle floral picks; you may need to make the wire stems longer or shorter depending on the type of bouquet you will have. Either way, these beaded tulle picks are the perfect way to add a touch of romance to the floral elements at your wedding. And don’t forget: you can always up the bling factor by using multiple colors of tulle and additional beads in your stems. Kat Richter is a freelance writer and newlywed who lives in Philadelphia and blogs at Fieldwork in Stilettos.